As Oil Ministry looks into reasons for delay in ONGC's KG basin gas development, the state-owned firm says it lost three years because the ministry and DGH refused to approve its partnership with Norway's Statoil and Petrobras of Brazil for the block. Oil and Natural Gas Corporation had in 2007 farmed out 15 per cent stake in the KG-DWN-98/2 block, which sits next to Reliance Industries' KG-D6 block, to Brazil's state-controlled oil firm Petroleo Brasileiro SA or Petrobras. Another 10 per cent interest was given to Norway's Norsk Hydro (now Statoil Hydro). The two firm, who are among the biggest deepsea developers in the world, were to bring in technology and expertise to development of gas discoveries in KG-DWN-98/2 or KG-D5 block of ONGC. 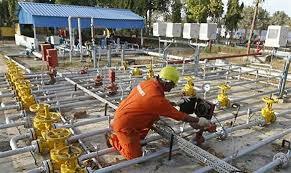 However, the ministry and its technical arm Directorate General of Hydrocarbons did not approve the equity participation of the foreign companies, leading to inordinate delays in clearing of drilling programme, ONGC sources said. Frustrated at delays, the two firms finally walked out of the block in 2010. KG-D5 block was originally planned to start producing gas from 2014 with a peak of about 20-25 million standard cubic meters per day. Now, the block will not produce before 2018. After the pullout of Petrobras and Statoil, ONGC, which does not have the technology to produce gas from deepsea in geologically hostile KG basin, tried to rope in other foreign energy majors but its attempts were frustrated as it could not get approvals, sources said. After the new government took over, the Oil Ministry is looking into reasons why ONGC has not started natural gas production from KG-D5, where 11 oil and gas discoveries have been made so far. In contrast, RIL's neighbouring KG-D6 block started gas output in April 2009. "This was done by ONGC as a part of its strategy to capitalise on the technological experience of international companies of repute in the development of deepwater discoveries," Sharma wrote. He stated that although the farm out agreements with Petrobras and Statoil were signed in August/September, 2007, "Joint Operating Agreement could not be signed with both these companies, initially, due to 9 months taken in obtaining approval on assignment of participating interest, and then one year in signing amendment to the Production Sharing Contract from various parties, including government." ONGC has made 11 oil and gas discoveries in the Block KG-DWN-98/2 or KG-D5. The block is divided into a Northern Discovery Area and Southern Discovery Area. It plans to invest $9 billion in producing from discoveries in NDA, sources said. ONGC is looking at producing 2.5-3 million tonnes of oil per annum and 9-10 million standard cubic metres per day of gas from the Northern Development Area of KG-D5 block. NDA holds an estimated 92.30 million tonnes of oil reserves and 97.568 billion cubic metres of inplace gas reserves spread over seven fields. Sources said ONGC has submitted to the DGH a Declaration of Commerciality for the oil find in the NDA and a detailed field development plan will be submitted by year-end. ONGC bought 90 per cent interest in Block KG-D5 from Cairn Energy India Ltd in 2005. Cairn still holds 10 per cent in the block. Before selling most of its stake and giving away operatorship of the block, Cairn made four discoveries in the area -- Padmavati, Kanakdurga, N-1 and R-1 (Annapurna). Subsequently, ONGC made six significant discoveries -- E-1, A1, U1, W1, D-1 and KT-1 in NDA and the first ultra-deepwater discovery UD-1 at a record depth of 2,841 metres. The NDA comprises discoveries like Padmawati, Kanadurga, D, E, U, A, while the ultra deepsea UD find lies in SDA. ONGC, sources said, is looking at producing oil and gas from NDA using a floating production, storage and offloading unit. An investment plan for UD-1 will be submitted separately, they added.